Developed by Centerstone’s Center for Clinical Excellence in collaboration with Centerstone leaders and experts, the Centerstone Health Home model is designed to serve those with co-occurring mental and physical health needs across the Centerstone enterprise footprint and beyond. Centerstone’s Health Home works with adults with moderate to high needs due to a co-occurring behavioral health disorder, physical health needs and/or at high risk of developing a chronic health condition. Collaborative efforts seek to equip health home clients with the tools, skills, and community connections needed to empower them to engage with their health home team and improve their physical and mental health and enjoy everyday life. Since 2010, Centerstone has been researching integrated care solutions for these individuals. Numerous integrated care programs and models have been successfully implemented, including Centerstone Research Institute’s coactionHealth program, Centerstone of Illinois’ Health Integration Project, Centerstone of Indiana’s Be Well integrated health home project, and Centerstone of Tennessee’s Well Connect initiative. Excellent Access—Receive treatment quickly and easily no matter your diagnosis, no matter your payer source. Personalized Care—Treatment tailored to your needs, your goals and your life. Treat to Target—The success of your treatment is measured according to the goals that you set with your care team. 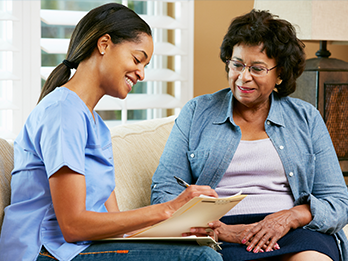 Person-centered, strengths based collaborative care planning to ensure all of a client’s needs, including physical health, mental health and social needs are addressed. Community health coaching with engagement, wellness monitoring, transitional care, discharge planning, health promotion activities, self-management skills training, and care management. Support from a peer wellness coach with lived experience of both behavioral and physical health conditions. Care coordination and health assessment services by team LPN or RN. Access to the full array of Centerstone outpatient services, including counseling and psychiatric medication management. Utilization of evidence-based practices including motivational interviewing, wellness recovery action planning (WRAP), and Illness Management and Recovery. The use of health information technology to facilitate care. Collaboration with family, friends and other natural supports of clients to increase support. Differential levels of care to provide the appropriate intensity of services based on client need and circumstances. Rapid response to each client’s care needs including ongoing assessment of social needs, level of engagement and outcomes to determine any need for care plan updates or other service changes.